Jennifer Lopez has told Sky News the "pain of her divorce" helped her "transform" as a person. The singer said her new film Dance Again became a form of therapy - as cameras documented life on her first world tour, which happened as she was dealing with the aftermath of her divorce from Marc Anthony. Lopez admits the finished film is a lot different to what she expected it to be. "It came together very organically - we didn't set out to make a movie - we just had cameras around to document the tour," she said. "At the time it just felt like they were always around catching stuff - but when we were back home a year later and we were editing it - I saw a lot of stuff happened to me and I actually learned a lot and there's a story here to be told." One of the emotional scenes in the film shows Lopez breaking down in tears while talking about the end of her 10-year relationship with Anthony. And Lopez admits, although it was tough at times, the constant attention of a camera crew became a cathartic experience. "I had just gone through a divorce, I realised this was going to be a really special journey - and it was - I was transforming - I was learning things. "I don't think if I'd been in as much pain as I was at the time, it would have happened that way: But I think a combination of that, going on tour, a lot of things happened and I wanted to share that." Dance Again documents Jennifer Lopez's 2012 World Tour - which visited 65 cities across five continents - performing to over one million fans. 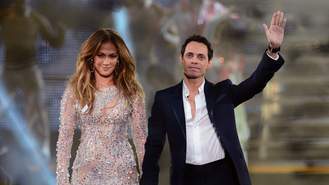 But for J-Lo - it was the reactions of two people that made the 100,000-mile journey worthwhile. "When I see my dad in the audience up close like that with a camera on him, I'm like 'oh wow he gets super excited' - and my mum - I know mum dances like that anyway - it doesn't matter where she is at a party, with three people, it doesn't matter, that's who she is. "But to see how proud she is, to hear her talk about me, when she didn't know if I'd hear it … it's very touching." The film's release marks a busy time for Lopez - she is a judge on American Idol's final season and in January begins a residency in Las Vegas. Sam Smith's second album will be out "in the next year or so". Iggy and The Stooges saxophonist Steve Mackay has died aged 66. One Direction gave their fans a treat when they unveiled the 17 song titles on their upcoming album, Made In The A.M, on Snapchat. Justin Bieber's team have threatened legal action against sites that published racy photographs of the singer snapped during his holiday in Bora Bora. Sir Paul McCartney and Michael Jackson swap vocals as a new remix and video of their duet, Say Say Say, is unveiled – 32 years after its original release. Iggy Azalea's new album will be called 'Digital Distortion'.